Daniel Branham is a doctor from Indiatlantic, Florida and he is on the BAI 2013 Everest Expedition. He first climbed with Berg Adventures in 2009 on Aconcagua. It was there that he met Steve Whittington and started planning an Everest expedition. In addition to Aconcagua, Daniel has climbed two others of the Seven Summits - Denali in Alaska and Kilimanjaro in Africa. His past experience on big mountain climbs has taught him that he will have plenty of downtime at Base Camp when he isn’t climbing, so he has brought his guitar along to help pass the time. Daniel is an Orthopedic Specialist who works primarily in upper extremity, hand, and trauma surgery. After finishing his medical degree at the University of Tennessee College of Medicine, he completed both his internship and residency at the Medical College of Virginia Hospitals. He has received the Compassionate Doctor Recognition and Patients’ Choice awards. When Daniel left Kathmandu to begin his journey to Everest Base Camp, he was accompanied by his sister, Katie, and girlfriend, Cassidy. 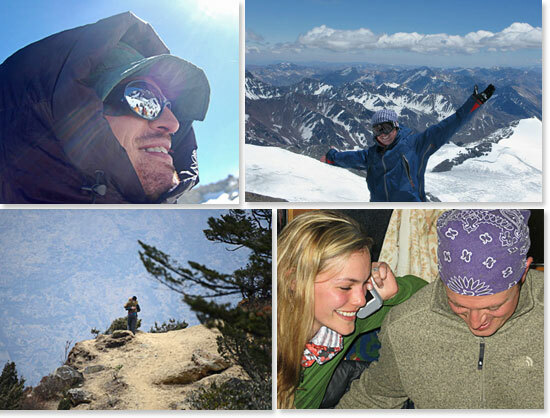 After a very romantic proposal in Tangboche, Daniel is now trekking with his fiancé, Cassidy. Check out the dispatch from his proposal. Read more about Daniel on his Everest Expedition blog here.